Perhaps, as a person on the internet, you are familiar with “on fleek.” (For the uninitiated and/or forgetful: The term, meaning “on point,” was popularized by Vine star Peaches Monroee, who used it in reference to her own eyebrows.) On Monday, the National Republican Congressional Committee (the entity that works to get members of the GOP elected to the House) announced that it, too, had heard of this “on fleek” business, via a tweet about President Obama’s proposed 2015 budget (see above). 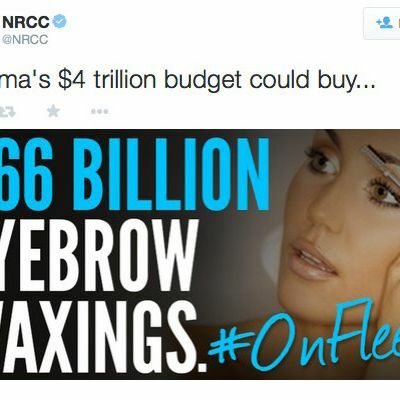 While the figure might be technically true (assuming a rate of $15 per brow wax), the NRCC’s hashtag usage seems … well, not on fleek. Stick with the golf idea, guys.